Just yesterday, we released a post on the new Unlimited Daily Data Plan from MTN which costs only N150. It is a sweet deal for downloaders and heavy data users but not really ideal for the light data users who just want to stay connected (without downloading heavily) for as long as possible at an affordable price. Because of these users, I'll be introducing the new Airtel 1 month data plan which costs N1000 with 3GB of Data. **UPDATE: Airtel has just confirmed that this plan is mainly for BlackBerry Phones even though some users are lucky that it's working on their non-BlackBerry devices. 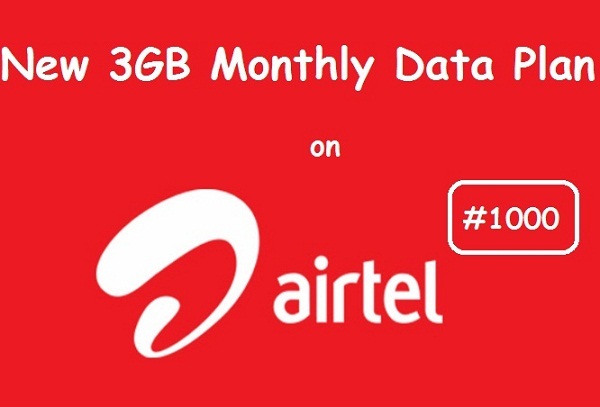 Just recently, Airtel launched their new 1 month 3GB data plan which works on ALL devices. Don't even think it's a BlackBerry plan that you need to tweak it to get it working on other devices or something. This is an official data plan from Airtel that works on ANY device. Now, you get more data for your money, just as simple as that. If you are interested in subscribing to this data plan, here is what you need to do. -> Dial *431# to activate. -> Dial *140# to check your balance. -> Note that the duration is 30 days. -> It works on ALL devices. Do you have fast Airtel 3G Network in your area? If yes, then you'll surely enjoy this data plan on your devices. What do you think about this new data plan from Airtel? Hot or Not? Kindly drop your comments through the comment box and please share this post with others. Cheers!!! This really sounds so good, i will try it as soon as possible. Thank you very much man, God bless you. Hello, thanks for dropping by. Sure you'll enjoy using it. Have a nice day ! Thanks it is working i just tried it. It is not a cheat. It's official from Airtel but some users also reported quick exhaustion like yours. Guess it's a prob on Airtel's end. Yeah, It's working... Just that it works on selected SIMs. The USSD Code is in the post. I feel good when I saw the subscription fee but I hope it will work fast and enjoyable. Presently the am on another package until it expired before I will now try this. Hi Ibrahim, you can try it out when you are through with your present package. I hope it works for you. Thanks for dropping-by. Have a nice week! Really sorry about that. According to the latest updates from users, it seems like the plan is presently under its experimental phase, as some users were able to use it smoothly on their Android devices while most were unable to. You can change your IMEI to BlackBerry's to make it work or use it to browse on a BB and remove it back to your phone. Let me know how it goes! Greetings, have subcribed the 3G for 1k but it's not working on my Samsung galaxy J700 and my Lumia phone. So sorry about that, it seems like the plan is presently under its experimental phase, as some users were able to use it smoothly on their devices while most were unable to. I subscribed to this package since the it was announced but up till now I can't access the internet. I've complained several times but nothing is being done to it. You should call Airtel Customer Care for refund. Most users are getting their money back. All these "bogus" data plans from Airtel always come at a price. They always charge you more than usual which makes the data to finish very quickly. Sorry about that! The post has been updated to keep people informed that it's an experimental plan for BB though it's working for some other devices though. Call Airtel CC for a refund. All those people are testified negatively. D4,this post is invalid. The post has been updated as you can see. And FYI, It's working for some non-BB users for real. Airtel customer agent said it's strictly for BB. I tried, not working on my android, said my money will be refunded. Thanks a lot for the nice words. God bless you too. Hope to see you around again. Hi Obot, the post has been updated earlier to notify people that it's actually a BlackBerry plan. I'd have suggested you call Airtel Customer Care to change it to an Android plan for you but it's late. Sorry about that!